Ohio ACTE is looking for graphic design students to submit cover ideas for the 2019 Annual Connections to Education Conference. Design the Annual Conference Program Cover: Ohio ACTE is looking for CTE student designed submissions for the front cover of the 2019 Connections to Education Conference program. The program is distributed to all conference attendees, presenters and vendors, and the contest winner will receive recognition in the program and the Ohio ACTE website! Click here for more information. The deadline for submission is May 12, 2019. Over the last several months, the career-technical education (CTE) community, represented by Ohio ACTE, the Ohio Association of Career Technical Superintendents (OACTS), and the Ohio Association of Compact and Comprehensive Career Technical Schools (Ohio CCS), convened to discuss all pertinent state policy issues impacting our schools, students, teachers and administrators. Those discussions commenced in the Fall of 2018 and included association leadership and dozens of other members. After robust discussion and consideration, the CTE associations developed an “issues list” and following a meeting with State Senator Matt Huffman (R-Lima), those issues were placed into legislation via SB 89. Requires ODE to a) notify CTPDs of any changes to the method and contents of EMIS data reporting, roughly six months prior to official implementation, and to b) establish a pilot program, with input from the CTE associations, to test functionality of the changes prior to implementation. Requires ODE to notify CTPDs after EMIS data becomes available for review and to establish an appeals process through which CTPDs may reconcile inaccuracies or discrepancies, prior to the issuance of sanctions. Permits a JVSD board of education to include in its calamity day plan the use of additional online lessons, student internships, student projects, or other options to make up any hours missed as the result of school closures among its member districts, for purposes of ensuring the JVSD meets the 1001 minimum hours requirement outlined under Ohio law. Permits a student to qualify for a high school diploma through the workforce graduation pathway by: 1) passing the WorkKeys assessment 2) obtaining an industry-recognized credential; or 3) obtaining a license that requires an examination and is issued by a state agency or board. Requires a) the use of the industry-recognized credentials list developed by the Ohio Department of Higher Education for purposes of school report cards and graduation requirements, and b) ODHE to solicit quarterly input from the CTE associations regarding the list of approved industry recognized credentials. The goal is to create one uniform CTE credential list for Ohio. Eliminates existing requirement that home school districts and CTPDs both take attendance, even if the student is in one building all day. Permits CTPDs to receive a STEM school equivalent designation in the same manner as a community school or chartered nonpublic school. Allows an approved substitute career-technical teacher to substitute teach in a classroom outside of their specific career field for up to 60 days, subject to approval of the district superintendent. Allows an individual holding an adult education permit to a) be employed outside the district that originally issued the permit; and b) to substitute teach in high school classrooms for up to 80 days in their specific career field. Prohibits the state from overruling collective funding agreements between schools that share students. Requires state institutions of higher education to provide transcripted credit to students who complete post-secondary courses approved through a local articulation agreement or through career-technical assurance guides, so long as the students pass the applicable course and accompanying assessments. Ohio ACTE continues to work with legislators and other education stakeholders to fine tune the SB 89 language. We anticipate another hearing to take place over the next several weeks, and will continue to keep association members apprised of new developments. This is a lengthy process and there will be tweaks to the language as well as other items under consideration for possible inclusion. 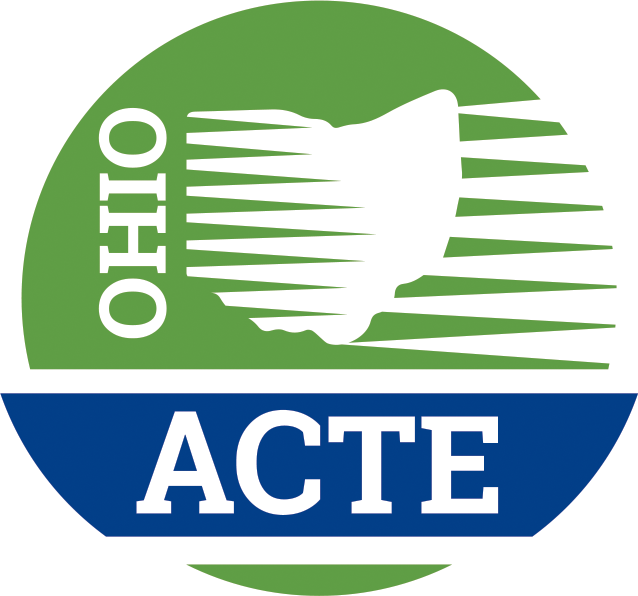 COLUMBUS, OHIO (March 18, 2019) – The Ohio Association for Career and Technical Education (Ohio ACTE) executive director Christine Gardner issued the following statement in reaction to Governor Mike DeWine’s 2020-2021 executive budget proposal. “Ohio’s career-technical educators are pleased that Gov. DeWine recognizes the importance of career-technical education as part of Ohio’s public education system, and the proposed budget reflects that commitment to expanding opportunities for Ohio’s students. It is so important for Ohio students and citizens to gain critical skills, credentials and work habits that lead to career success in today’s workforce. Ohio’s career-tech educators serve all students: Middle grade students participate in career exploration and introductory career-tech courses and high school students work toward a workplace credential, certificate or skill they can use to prosper in the job market. Adult students also have the opportunity to take advantage of short-term, targeted education through their local Ohio Technical Center. Gov. DeWine has long been a supporter of the work career-tech educators do every day in career-technical programs across Ohio, and his budget recommendations show further backing for career-tech ed, as well as promote the image of these programs. The Ohio Department of Education on March 13 welcomed more than 250 students from several dozen high schools around the state to celebrate their commitments to serve in the U.S. military. High school seniors and juniors who are entering service academies or have committed to serve as active duty, Reserve or National Guard members were invited to take part in the Armed Forces Career Commitment Ceremony at COSI (Center of Science and Industry), 333 West Broad St., in Columbus. The students signed commitment letters, received red, white, and blue cords from the USO, and celebrated with their families and members of the military and education communities. Terry McDermott, a veteran of the 82nd Airborne Division and an educator at Olentangy Orange High School, provided opening remarks. Grove City Central Crossing High School’s Naval Junior Reserve Officers Training Corps conducted the presentation of colors, with service song accompaniment by Anthony Wayne High School’s Symphonic Winds. David Porter of the U.S. Army, 2018 graduate and enlisted service member. Retired Col. Thomas N. Moe of the U.S. Air Force, former prisoner of war for five and one-half years. Gen. James R. Camp, who serves as Ohio assistant adjutant general for Air. Retired Maj. Gen. Deborah Ashenhurst, who serves as director of the Ohio Department of Veterans Services. Chad Marzec, 2006 graduate of West Point Military Academy and a varsity coach at Liberty-Benton High School in Findlay. This marks the second annual Armed Forces Career Commitment Ceremony. The 2019 Annual Connections to Education Conference will take place July 29-31 at the Hilton Easton Columbus. Preliminary topics and the schedule has been released, see the list and overall conference schedule, click here. Registration is open, register today! Click here. Business groups are skeptical of a key element in the State Board of Education's proposed graduation overhaul and want a new system in place faster. The board's Graduation Requirements and High School Redesign Task Force met March 4 to review the graduation proposal ahead of next week's board meeting. The board is scheduled to vote on it then to meet an April 1 deadline to send more details about its plan to lawmakers. The proposal, first endorsed by the board late last year, would supplement existing graduation pathways with a new option through which students would demonstrate their knowledge in five areas: English; math; well-rounded content; technology; and leadership, reasoning and social-emotional learning. Students could meet the requirement in a given area through the usual state tests, or by other means such as taking a relevant College Credit Plus course or completing a demonstration project, for example. The proposal also includes a "culminating student experience," in which students would give some sort of presentation that demonstrates their evidence of knowledge and skills and competency in math, writing and research. It could take the form of a research project, art portfolio, community service project or career-technical education program, among other options. Ohio Governor Mike DeWine gave his 2019 State of the State address Tuesday, March 5 during a joint session of the Ohio General Assembly, focusing on themes including investing in children, workers, infrastructure, and Lake Erie and water resources, as well as a continued effort in combatting the state's addiction epidemic. "It is time for us to invest in our children, in our workers, in our roads and bridges, in our infrastructure, and in Lake Erie and in our state parks and other natural wonders," said DeWine in his address. "Simply put—it is time for us to invest in our future!" Workforce development was a theme DeWine reiterated as a priority in his speech, helping both Ohio citizens and job creators. "We are going to help businesses in Ohio through increased opportunity zones, and we are going to help Ohio college students by having every one of our public universities offer guaranteed tuition—that won’t increase one dime—over the four years the student is in college," said DeWine. "We’re going to invest more in our career-tech centers and two-year community colleges, and we are going to create at least 10,000 industry certificates." Substantial investment in efforts to ensure the long-term health and protection of Lake Erie and other Ohio bodies of water through a new H2-Ohio Fund. "We have so much to appreciate, and we need to support and expand efforts that are working to preserve and protect our state's natural wonders—from Lake Erie to all our lakes and rivers," said DeWine. "That is why—through the budget that I will submit to you in a few days—we will create a new fund called the H2-Ohio Fund, to invest in targeted solutions to ensure safe and clean water all across the state of Ohio." Enhanced assistance to law enforcement through a new Narcotics Intelligence Center operated at the Ohio Department of Public Safety. "We will also empower local law enforcement through our creation of a new, highly specialized Narcotics Intelligence Center," said DeWine. "This innovative new center will provide local law enforcement with enhanced intelligence and high-tech analytical capabilities to strengthen criminal investigations and improve public safety." Increased wrap-around services models for in-need youth. "We are going to expand wrap-around service models, such as the Ohio Sobriety, Treatment, Abuse, and Reducing Trauma program, known as OhioSTART," said DeWine. "It provides specialized victim services to children who have been abused or neglected because of parental drug use, and it provides drug treatment for those parents." Substance abuse prevention education each year in grade levels from Kindergarten to 12th grade. "We are going to consistently and continually educate children in Kindergarten through 12th grade on the dangers of drugs, alcohol, and tobacco use and teach them the skills—through a much-needed focus on social-emotional learning—on how to make healthy decisions throughout their lives," said DeWine. Increased resources to local communities to combat the addiction epidemic, including increased treatment capacity and a new public health fund that will leverage resources to increase public health awareness and prevention strategies. "We are going to expand the state's treatment capacity first with more crisis support for children and for adults struggling with mental illness and addiction," said DeWine. DeWine also continued stressing the importance of investing in Ohio's roads, highways, and bridges that he made the focus of his transportation budget. "Our families should not be driving on roads that are crumbling and bridges that are failing," said DeWine. "The state has avoided its responsibility for too long—and now is the time to act. To do anything less is simply irresponsible." EMIS/ODE has been asked why Career and Technical Education centers which house pre-school programs have to start reporting data to the Ohio Department of Education. This memo will explain why and what needs to be reported for whom. If you are a CTE/JVSD with a licensed preschool who receives Early Childhood Education grant funds from ODE, you must report student data for preschool students. If you are a CTE/JVSD with a licensed preschool who does not receive any money from ODE to operate, you must report student data for preschool students. More than an award, the State Board of Education’s Ohio Teacher of the Year program annually identifies exceptional teachers and celebrates their effective, inspiring work both inside and outside of the classroom. The nomination period for the 2020 Ohio Teacher of the Year is now through April 5, 2019. Ohio Superintendent of Public Instruction Paolo DeMaria visited three career-technical schools Feb. 22 to celebrate how career-tech programs across Ohio prepare students for bright futures. DeMaria met with students and staff at Swiss Hills Career Center in Woodsfield, Belmont-Harrison in St. Clairsville and the Career and Technology Education Centers (C-TEC) of Licking County in Newark to celebrate Career-Technical Education Month, which was February. DeMaria discussed with students their choice for career-tech education and how it benefits them and their future. Nationally, 75 percent of career-technical students move on to postsecondary education programs. The first stop on DeMaria’s school tour was Swiss Hills Career Center, which offers programs ranging from business administration and management to cosmetology and a recently expanded construction trades program. The construction trades program will provide students with a new specialization in heavy equipment operating beginning in fall 2019. DeMaria also visited Belmont-Harrison Career Center, where 23 programs are offered across two campuses. The center focuses on academic and career-technical programs that prepare students for postsecondary education and opportunities to earn state and national industry credentials. Qualified seniors are eligible for early job placement during school hours. Wrapping up his career-tech tour, DeMaria toured C-TEC of Licking County, which serves 11 school districts with 20 innovative programs for high school students. C-TEC partners with Ariel Corporation, a Mount Vernon manufacturer of high-speed gas reciprocating compressors, to train students to fill entry-level and skilled positions. You can watch the video on the Department's Facebook and Twitter channels.